01. 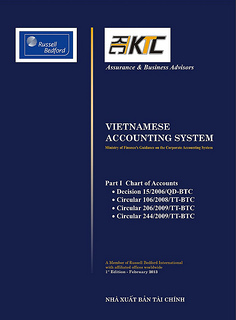 The objective of this Standard is to prescribe the accounting policies and procedures in relation to investments in associates, including: recognition of investments in associates in separate financial statement of investor and consolidated financial statement as the basis for bookkeeping, preparation and presentation of financial statements. 02. This Standard should be applied in accounting by an investor who has significant influence for investments in associates. An associate is an enterprise in which the investor has significant influence and which is neither a subsidiary nor a joint venture of the investor. Significant influence is the power to participate in the financial and operating policy decisions of the investee but is not control over those policies. Control is the power to govern the financial and operating policies of an enterprise so as to obtain benefits from its activities. A subsidiary is an enterprise that is controlled by another enterprise (known as the parent). The equity method is a method of accounting whereby the investment is initially recorded at cost and adjusted thereafter for the post acquisition change in the investor's share of net assets of the investee. The income statement reflects the investor's share of the results of operations of the investee. The cost method is a method of accounting whereby the investment is recorded at cost without adjustment thereafter for the post acquisition change in the investor's share of net assets of the investee. The income statement reflects income from the investment only to the extent that the investor receives distributions from accumulated net profits of the investee arising subsequent to the date of acquisition. Net asset is the total assets less (-) liabilities. 04. If an investor holds, directly or indirectly through subsidiaries, 20% or more of the voting power of the investee, it is presumed that the investor does have significant influence, unless otherwise regulated or agree upon. Conversely, if the investor holds, directly or indirectly through subsidiaries, less than 20% of the voting power of the investee, it is presumed that the investor does not have significant influence, unless otherwise regulated or agree upon. (e) provision of essential technical information. 06. Under the equity method, the investment is initially recorded at cost and the carrying amount is increased or decreased to recognise the investor's share of the profits or losses of the investee after the date of acquisition. Distributions received from an investee reduce the carrying amount of the investment. Adjustments to the carrying amount have to be made for alterations in the investor's proportionate interest in the investee arising from changes in the investee's equity that have not been included in the income statement. Such changes include those arising from the revaluation of property, plant, equipment and investments, from foreign exchange translation differences and from the adjustment of differences arising on business combinations. 07. Under the cost method, an investor records its investment in the investee at cost. The investor recognises income in its Income Statement only to the extent that it receives distributions from the accumulated net profits of the investee arising subsequent to the date of acquisition by the investor. Distributions received in excess of such profits are considered a recovery of investment and are recorded as a reduction of the cost of the investment. 08. An investment in an associate that is included in the separate financial statements of an investor should be accounted for under the cost method. (b) The associate operates under severe long-term restrictions that significantly impair its ability to transfer funds to the investor. In this case, an investment in the associate is accounted for using the cost method in the consolidated financial statements. 10. The recognition of income on the basis of distributions received may not be an adequate measure of the income earned by an investor on an investment in an associate because the distributions received may bear little relationship to the performance of the associate. As the investor has significant influence over the associate, and has responsibility for the associate's performance, the investor accounts for this stewardship by extending the scope of its consolidated financial statements to include the returns on its investment commensurate with its share of results of such an associate. The application of the equity method provides more informative reporting of the net assets and net income of the investor than that of the cost method. (b) the use of the equity method is no longer appropriate because the associate operates under severe long-term restrictions that significantly impair its ability to transfer funds to the investor. The carrying amount of the investment at that date should be regarded as cost thereafter. (b) amortisation of the difference between the cost of the investment and the investor's share of the fair values of the net identifiable assets. 13. Financial statements of the associate used by the investor in applying the equity method must be drawn up to the same date as that of the financial statements of the investor. When it is impracticable to do this, financial statements drawn up to a different reporting date may be used. 14. When financial statements with a different reporting date are used, adjustments are made for the effects of any significant events or transactions between the investor and the associate that occur between the date of the associate's financial statements and the date of the investor's financial statements. 15. The investor's financial statements are prepared using uniform accounting policies for like transactions and events in similar circumstances. If an associate uses accounting policies other than those adopted by the investor for like transactions and events in similar circumstances, appropriate adjustments are made to the associate's financial statements when they are used by the investor in applying the equity method. If it is not practicable for such adjustments to be calculated, that fact should be disclosed. 16. If an associate has outstanding cumulative preferred shares held by outside interest, the investor computes its share of profits or losses after adjusting for the preferred dividends, whether or not the dividends have been declared. 17. If, under the equity method, an investor's share of losses of an associate equals or exceeds the carrying amount of an investment, the investor ordinarily discontinues including its share of further losses in its consolidated financial statements, except when the investor has obligations to pay on behalf of the associate to satisfy obligations of the associate that the investor has guaranteed or otherwise committed.The investment is then reported at nil (0) value. If the associate subsequently reports profits, the investor resumes including its share of those profits only after its share of the profits equals the share of net losses not recognised. 18. If there is an indication that an investment in an associate may be impaired, an enterprise applies Accounting Standard “Impairment of Assets”. 19. Income taxes arising from investments in associates (if any) are accounted for in accordance with Accounting Standard “Income Taxes”. (b) the methods used to account for such investments. 22. Investments in associates accounted for using the equity method should be classified as long-term assets and disclosed as a separate item in the consolidated balance sheet. The investor's share of the profits or losses of such investments should be disclosed as a separate item in the consolidated income statement.